May 29 was yet another cap bust, as storms were eventually defeated by the capping inversion, the warm temperatures above the surface. I’m exhausted, and tomorrow is likely my last chase day on this trip, so I’m going to get some sleep. See the photos. 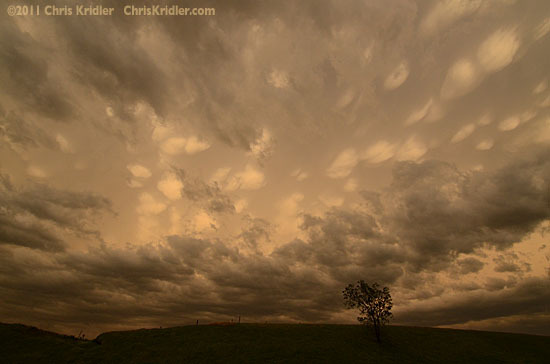 What does one do while driving thousands of miles and, as has happened the last two days, busting on storm chases? Take a few pictures. I wish I’d taken more, but so much time is consumed by actually getting from one place to another. The freakin’ distances out here are massive. Anyway, check out the photos. The potent tornado machine is slowly moving east, losing a little of its punch, though my friends in Pennsylvania should watch the weather today. Florida might get storms, too. I hope we get rain at home to keep the plants happy! I chose not to chase in the hills and trees yesterday and instead repositioned north and west. I plan to go into Colorado to see what storms I can catch today. I’m looking for a little of that upslope magic. I’m slowly catching up on my chase reports. 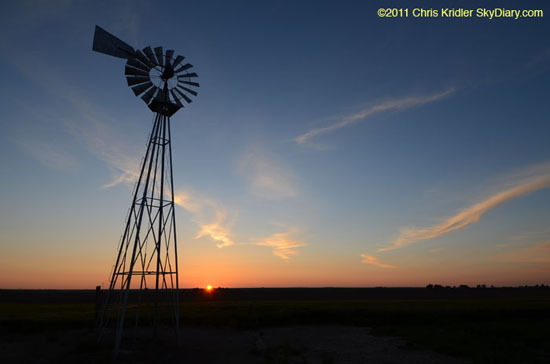 Check out all the 2011 photo logs. The latest addition is the day of the Joplin, Missouri, tornado, which I did not chase, instead choosing to go after a promising area in southern Oklahoma. Again, it meant fewer hills and trees, and that’s a factor in the decisions that chasers make sometimes. Visibility is important. That day I also saw the TIV and the Dominator on the road, which you may have seen in Discovery’s “Storm Chasers” show. 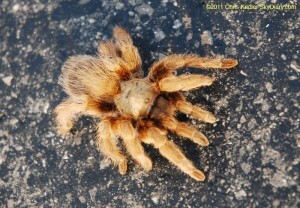 I saw storms that day and, of all things, a couple of tarantulas! See the May 22 photos. Storm Prediction Center early outlook for today, May 25. People seem transfixed by the damage and deaths from this year’s insanely deadly tornado season, including yesterday’s outbreak. I wish more people had been glued to media yesterday, when it might have saved their lives. But some of the tornadoes would not have been survivable unless people were underground. It was also extremely hazardous and difficult chasing. “Our” storm produced a beautiful tornado just before we arrived, and then we were behind the curve. I dallied to see a second line of storms forming, and by the time it collapsed, it really was too late to get ahead of the line, which was moving at highway speeds and offered no safe places to squeak around the big tornadoes they were dropping. I didn’t have the will to punch the core of these monster storms. I’ve never seen a setup like that while chasing in the Plains. Compared with the May 3, 1999, outbreak, another famous day of destruction in Oklahoma, my understanding is that these tornadoes were moving faster and were more numerous and much harder to see. Several were wrapped in rain. Nonetheless – I’m not the only chaser who didn’t see much May 24, but I still feel bad about it. Today’s setup is almost as volatile, but farther east, in more difficult chase territory. I don’t think I could get into play before the storms go up, given that I’m in Norman, Oklahoma, this morning. By the way, I’m extremely glad Norman is still here. When the warnings were coming out yesterday, it sounded as if it might be wiped off the map. 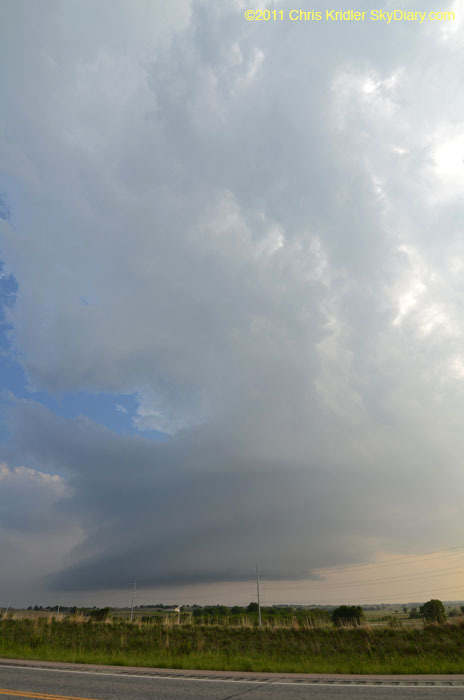 On a better note, I had a fantastic day May 23, when I saw a slim tornado, a beautiful low-precipitation supercell, hail, flooding and lightning. 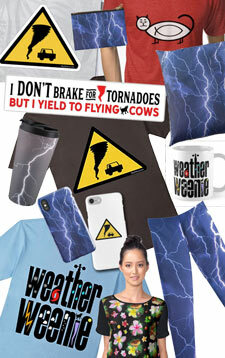 All without worrying about tornado-geddon! 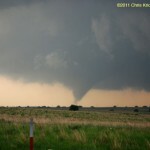 I’ve posted pictures of the May 23 chase. The Storm Prediction Center has issued a high risk for today for the heart of Oklahoma. Southern Kansas is also in the target area. Wind profiles today are insane, and those and other parameters suggest a tornado outbreak is possible. So I am feeling a mix of dread and excitement … dread for those who live here, and excitement (and anxiety) about the chase. The storms are likely to be moving at scary speeds, so it will be a challenge. In favor of getting a few hours of sleep, I didn’t post pix from yesterday – May 23 – which was a wonderful chase day. 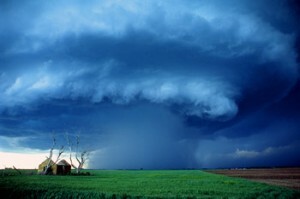 I saw a slim tornado, hail, flooding, a gorgeous structured storm, and lightning. I hope everyone has their weather radios on today. Heed warnings. End of day update: Ugh! 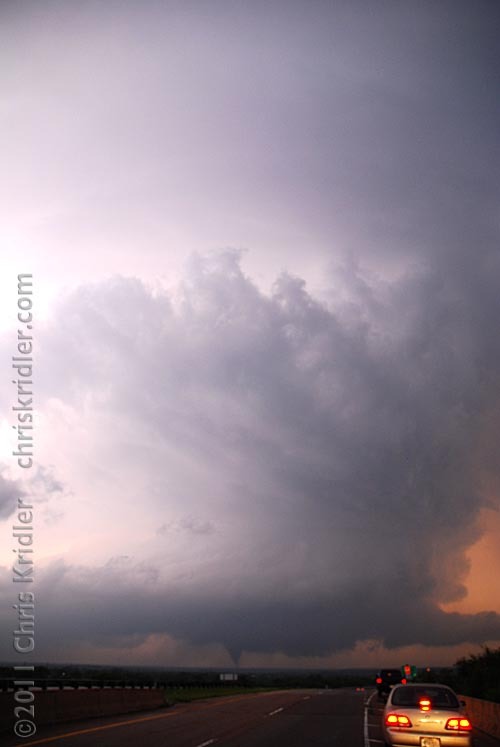 The storm we targeted in northwest Oklahoma produced a beautiful, huge tornado over a lake – shortly before or about the time we got to it. Unfortunately, terrible visibility and bad timing meant we didn’t see it. Two of our party went into the precip core to see a subsequent rope tornado, but I didn’t, and the rain obscured it. And then I was caught behind the line of storms as they screamed east at highway speeds, dropping massive and destructive tornadoes in some cases, often wrapped in rain and invisible. Some chasers “saw” but didn’t see these wedges; at least one friend nearly was killed by one. In a way, I’m glad I didn’t get aggressive and try to punch that line, but I’m disappointed I didn’t see more of this historic outbreak, and I am saddened at all of the destruction and loss of life. This has been a terrible year for tornado deaths. I’m almost caught up on storm-chasing photos (after staying up half the night again). 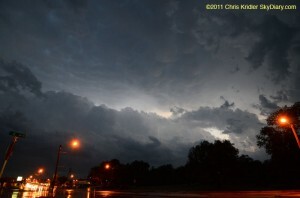 I saw severe storms Sunday, but not much to write home about, though I will post a few photos eventually. I was saddened to hear of the devastation in Joplin, Missouri. Some of my chaser friends were on the scene and helped victims of the tornado. In the meantime, I have posted photos of the beautiful Kansas storms of May 20 and photos of the southeast Oklahoma tornadoes of May 21. Please take a look! It’s about 4 a.m. CDT, and I’m making this post fast, so I can get to sleep. I had a glorious chase in southwest Kansas today (May 20 is still today for me, at the moment), as minor storms firing off the dryline offered lovely photo opportunities as they gained strength. I started with a big group of friends, but the company soon narrowed to Jason Persoff and Robert Balogh as we split in different directions around the storms. 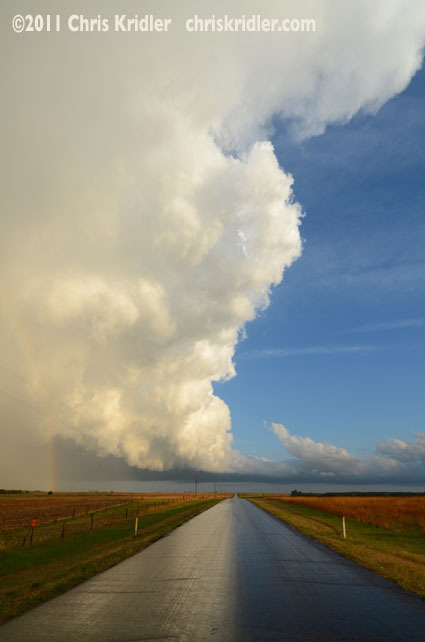 We kept going after the southern storms forming on the line, all in the vicinity of Pratt, Kansas. Here is just one shot; I have a lot more to post, but time ran out tonight after trouble on the road. Just 10 miles west of Wichita late at night on the way into town and to our hotel rooms, Jason hit a deer. Or maybe we should say the deer hit Jason. Either way, Jason was OK, but the deer and the rental car were both in bad shape. Many phone calls, the kind attention of a wonderful police officer, and a tow truck later, and all Jason’s stuff was in Robert’s and my vehicles, and we were able to get under way again. We got in about 2 a.m., and it’s taken me forever to get all the photos off my cards. I just don’t have time to process them all tonight before lapsing into unconsciousness, so … more later!